Charlotte, North Carolina — A girl that was born without eyes or a nose has become an inspiration to many across the nation because of her strong spirit and zest for life. Cassidy Hooper, 16, has been making headlines both in the local and national media as many are intrigued by this teen who refuses to let a disability really become one. Hooper, who lives in Charlotte, North Carolina, attends a local school for the blind, and says that her teacher calls her a technology guru. She’s studying Spanish in braille and runs on the track team. Hooper has also taken up the sport of curling. While she may get stares sometimes because of the cavity where her nose would be and the fact that she is blind, her mother asserts that she is like any other teenager. “When somebody says something, I just try not to let it bother me,” the girl said. Doctors state that they aren’t certain as to the reason for her birth defect, but estimate that the problem began at approximately two weeks of gestation. Writer Michael Brown says that Hooper is a testimony to the value of life. Hooper has taken an interest in broadcast journalism and hopes to pursue it as a career. She was recently given the opportunity to visit a radio studio and talk on the microphone. 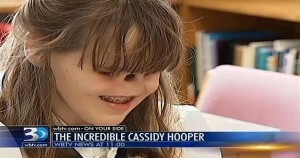 Soon, Hooper will undergo a series of surgeries as doctors construct a nose for the teenager. Her parents had considered having the procedure completed years ago, but needed to wait until the girl stopped growing. The process involves creating skin flaps from grafts taken from another part of her body. When the surgeries are complete, Hooper will be able to smell for the first time. “There’s only about three to four [surgeries] left, and they’re all within a three week period,” she explained. Hooper has two sisters, ages 18 and 12.